The Well Aging Fiddler: Good Teachers are Gold. March 27, 2019, 3:40 PM · My violin teacher, Mirabai Peart, and I arrived at my 75th lesson last week. With that she asked if I needed a break from the lessons. We continued the lesson with our usual focus, little jokes, corrections, comments and so forth. When I started all of this almost two years ago, I figured I’d take lessons for a couple of years, get the basics down, and then move on to the next challenge. However, something happened. I got into it. I mean I really got into it. This whole violin thing has crawled under my skin, and I can’t really see an end point in any of this. There is always something new to learn, or something to refine, or to relearn, and so on. It’s a slow process, it’s occasionally frustrating, time consuming, repetitious, a minefield of mistakes and humility, and delightfully transformative. The biggest plus to all of this is that I’ve serendipitously come upon a teacher I can enjoy and communicate with when discussing every little aspect of the violin. The musical selections are delightfully eclectic – classical, bluegrass, blues, Scandinavian, Hungarian, Romanian, traditional American, and so on. She doesn’t let me get away with anything as far as technique goes, and at the same time she demonstrates patience and optimism. The lessons are challenging and progressive. She communicates a celebratory atmosphere, and having been a teacher for 37 years, I know that ain’t always easy to do. What is very important is the fact that I’m not being patronized. My teacher is over 30 years younger than I am, but the sense of respect, eye-to-eye understanding, and mutual good humor erases a situation that could be difficult for some people. She’ll go from teaching a three-year-old little girl, to teaching me at almost 70, to a fourth grader without pause. My only complaint is I don’t get stickers. All the kids get stickers. They get gold stars, shiny cows, llamas, and a whole bunch of other nifty shapes. I just get a smile, but I’ll take it. Now, I certainly understand the need to work with different teachers if you want to specialize in a certain area like classical music, Bluegrass, and so forth. I’ve even attended single classes or workshops. I think that’s healthy. My point is this – when you find a teacher you can click with in an atmosphere where both of you can enjoy the experience - don’t take it for granted. I’ve heard horror stories of teachers and students with poor chemistry. I read about a woman who took lessons as a child, and being proud of one of her songs, she took her violin to her fourth grade class and played it for everyone. Her teacher heard about it and yelled at her, saying “I will decide when you can play for others!” The girl was so hurt she quit. My daughter started taking piano lessons when she was four years old. She was quite talented, playing recitals, playing in school talent shows, and so forth. When she was twelve or thirteen she found the sheet music to “Great Balls of Fire” by Jerry Lee Lewis. She thought that would be fun, and took the music to her next lesson. Well, her teacher was furious and insisted that only she would determine what music would or would not be played in lessons. I should point out that all was not lost. She took up flute, had first chair through middle school and high school, attended the Interlochen Center for the Arts summer camp, played through college with a small ensemble, and continues to play today. I have a friend who took old time and Bluegrass guitar lessons for a few months from a teacher who was a superior guitarist. This guy was the real deal. As a musician he was in a rare superior category. However, his teaching technique was a little – shall we say – rough. The lessons were held on Saturday mornings in a small booth in back of a music store. He’d come in and it was immediately clear he’d been enjoying a few drinks the night before the lesson, giving the room a certain edgy perfume. Usually, he’d forget to bring something in for the student that he’d promised the week before. For at least a third of the thirty-minute lesson he’d just sit there and fingerpick. I guess he assumed my friend could learn from simply watching. I’m sure most violin teachers – most music teachers in general – are good and even excellent. They get it. They understand the needs of their students, and they rise to the challenges of the profession. I’m sure they are easy to find. However, some teachers don’t really know enough about what they’re doing. Others know but can’t communicate that knowledge. Some let their ego rule the day, and I had one teacher who just looked off to the side and talked and talked and talked. A few are flat out lazy. So, when you find a good one – it’s gold. Therefore, don’t take it for granted. Listen to the person. Practice. Then listen and practice some more. Let yourself fall into it, and don’t worry about where it is going. It’s important to recognize when things are going as well as they can, and if you’ve got a good teacher, and you’re into the learning, it can’t get any better than that. The Well Aging Fiddler: Perfection? Forget about it. March 28, 2019 at 04:33 AM · Totally agree. Nothing like a good teacher to show you possibilities for your own playing that you never would have imagined. March 28, 2019 at 10:29 AM · Such a great story-and I totally agree! I started middle school with a great public school teacher who managed the school district's orchestra on his own time and dime (which is rare because they are overworked and underpaid most of the time). Even though he had high expectations, he was encouraging and had a positive attitude, which helped set a good foundation for learning violin. I went to college where the instructor was horrible (always in a foul mood, never encouraging, demanding) and I quit playing for awhile. Now I am finishing up grad school in biochemistry and my current instructor is wonderful! It was like I went back to the fun times I had in school learning and trying new things. (My only complaint too is that I don't get stickers like the other kids...haha) Definitely don't take a good instructor for granted!! March 28, 2019 at 01:39 PM · I also agree. You can give yourself stickers, I do that from time to time. Why not?! March 28, 2019 at 02:34 PM · Yesterday, after she saw this posting, my teacher gave me a big Gold Star and a cat sticker! Cool, eh? 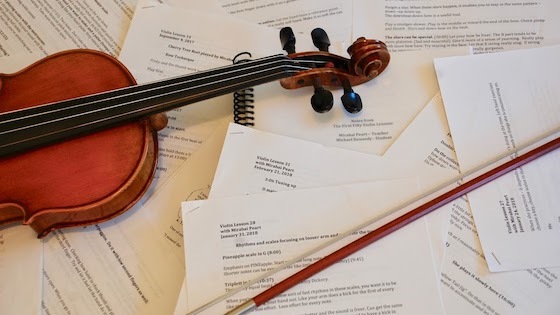 March 30, 2019 at 04:44 PM · Public school teachers have an advantage...to just take private lessons and perhaps offer your segment in a group recital is OK, but when the school orchestra teacher explains that "We're Practicing and Preparing 'cause on June 14th at 7:30, the auditorium will be packed with your parents, anxious to hear what you've been doing.....let's not disappoint them"...a powerful incentive to prepare.